As he worked with curators to set the parameters for his new survey exhibition Polyphonic, Stieg Persson was not interested in mounting a straightforward linear chronology. Taking out almost all of the space at the University of Melbourne’s sizeable Ian Potter Museum of Art, Persson’s show covers much territory and is broken into distinct thematic zones – the ‘black’ works here, the ‘Brighton’ works there, the skeletal studies up one wall, and the ‘death metal’ pieces coming down another one. We are led along by engaging ideas, colours and visual phrases rather than the course of the artist’s life. Stieg Persson, South 1998, oil on canvas. Courtesy of the artist and Anna Schwartz Gallery. Curated by Samantha Comte and the Potter’s director Kelly Gellatly, Polyphonic is aptly titled, exploring the many voices with which Persson speaks – but also tracing the connecting tones and notes within his breadth of work. As he led the curators through the extensiveness of his art – he is a steady worker who puts in a daily 9-5 routine – they began to pick up on various recurring scenes, methods or ideas that he had not always been conscious of. Persson says he has always given himself free licence to “paint kittens and rabbits” or to do everything pink if that is what he wants, without having to justify it. The result is that he enters into the work without constraint, and the deeper themes and ideas emerge. A painter with a strong visual vocabulary, he says that the process of working can lead the direction in which the painting is going. 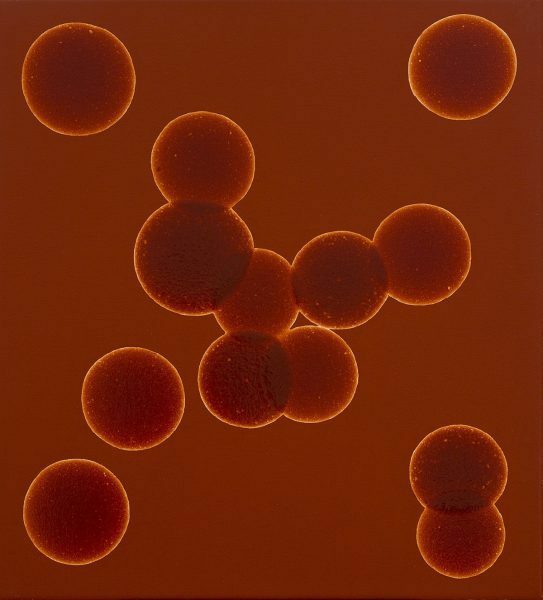 Stieg Persson, Pathologie 2005, oil and alkyd resin on linen. Courtesy of the artist and Anna Schwartz Gallery. Comte describes Persson’s works as both exquisitely painted and beguiling in their effect on us. She says one of the really strong linking elements within this painter’s 30 years of work is his exploration of the multiple voices within our society, drawing on them with an underlying examination of what purpose painting serves, asking whether it is still able to be an authentic mode of self-expression. Even in his early ‘black’ paintings and collages, Comte sees some of the motifs that have persisted, such as a swirling arabesque, various decorative elements and an interest in modernism, taste, class, art history and traditional painting styles. “This comes back to the idea of many voices and the layering of art history and culture,” she says. 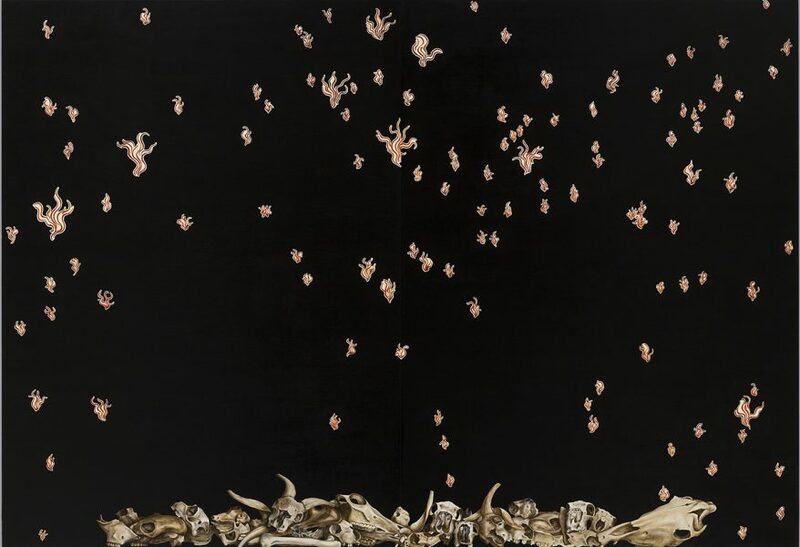 Comte and Gellatly have cleverly portioned the works so that we see these different levels emerging, from early works with X-ray imagery done during a hospital residency, to a series of skeleton and skull studies made while he was teaching TAFE students, to the death metal works he made while on a residency in the Swedish city Gothenburg. There, he drew links between heavy metal culture and its strange interest in classical art imagery, and its connections with particular segments of middle-class youth. Likewise, his most recent works examine the complex sides of the middle-class. Featured image: Stieg Persson, Dinner with the Abbotts, 2014. Oil on linen. Courtesy the artist and Anna Schwartz Gallery.